The Twins played in Metropolitan Stadium from 1961 to 1981 and the Hubert H. Humphrey Metrodome from 1982 to 2009. 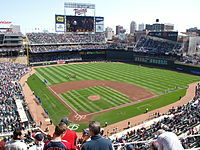 The team played its inaugural game at Target Field on April 12, 2010. In 2017, the Twins went 85–77, finishing 2nd In the AL Central. Following Brian Dozier's 34 home runs, Miguel Sano, Byron Buxton, and Eddie Rosario all had breakout years. Joe Mauer hit .305, and overall it was a good year for everyone. They ended up making the playoffs, which made them the first ever team to lose 100 games the previous season and make the playoffs the next season. They lost to the Yankees in the wild card round. Free agent signing Logan Morrison and long-time veteran Ervin Santana declared free agency. The 2018 season did not go as well. The Twins went 78–84, and did not return to the post-season. Sano and Buxton were injured most of the year and eventually both sent down to the minors, while long-time Twin Brian Dozier was traded at the deadline. One bright spot came at the end of the season, when hometown hero Joe Mauer returned to catcher (his original position) for his final game, ending his career with a signature double and standing ovation. Another highlight was the team's two-game series against the Cleveland Indians in San Juan, Puerto Rico. After the season, manager Paul Molitor was fired. Free agent signing Logan Morrison and long-time veteran Ervin Santana declared free agency. During the 2019 off-season, the Twins hired Rocco Baldelli as their new manager, signed free agents Marwin Gonzalez, Jonathan Schoop, Nelson Cruz, and claimed CJ Cron off of waivers from the Tampa Bay Rays. Cron had 30 homeruns in the 2018 season. They also signed Martín Pérez, Ronald Torreyes, and Blake Parker. Third baseman Miguel Sano had surgery on his Achilles area in March and is expected to be out until May. ^ Randhawa, Manny. "Twins tab Rocco Baldelli as new manager". mlb.com. Major League Baseball. Retrieved October 25, 2018. ^ "Washington Senators". BaseballLibrary.com. Retrieved August 7, 2009. ^ Jim Souhan (March 27, 1998). "Kirby says goodbye". StarTribune. Archived from the original on October 17, 2012. Retrieved July 17, 2011. ^ "Twins dump Tigers to end season at 85-77". ^ "2017 Minnesota Twins Statistics". Baseball-Reference.com. Retrieved April 16, 2019. ^ "Minnesota Twins Clinch Playoff Berth for 2017 MLB Postseason". ^ "Twins Become 1st Team to Make Playoffs One Year After Losing 100-Plus Games". ^ "Wild start! Yanks' pop, 'pen erase Minn". ^ a b c "Twins 2019 Off Season Transactions". CBS Sports. CBS. ^ "Dodgers add depth in trades for Dozier, Axford". ^ "Joe Mauer Doubles, Catches In Finale". MLB.com. Major League Baseball. ^ "Indians, Twins to play in Puerto Rico in 2018". MLB.com. Retrieved April 18, 2018. ^ Wells, Adam. "Twins, Indians to Play 2-Game Series in Puerto Rico in 2018". Bleacher Report. Retrieved April 18, 2018. ^ "Twins fire manager Paul Molitor after 78-84 finish". Chron.com. ^ "Twins Hire New Manager". MLB.com. ^ "Twins Sign Marwin Gonzalez". MLB Trade Rumors. ^ "Twins' Miguel Sano has heel procedure, could be out until May". ^ Thesier, Kelly (January 23, 2009). 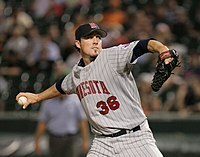 "Radke, Brophy join Twins Hall of Fame". Minnesota Twins. Retrieved January 25, 2009. ^ Thesier, Kelly (February 9, 2010). "Gagne elected to Twins Hall of Fame". Minnesota Twins. Retrieved July 17, 2010. ^ Thesier, Kelly (January 25, 2011). "Twins great Perry gains entrance to club's Hall". 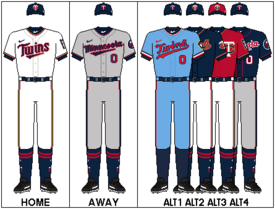 Minnesota Twins. Retrieved January 25, 2011.